The two-thousand-plus page financial reform bill passed into law this summer aims to prevent crises of the kind that hit the country two years ago by protecting consumers and tightening regulations on everything from private equity firms to credit cards. Before Sebastian Mallaby visits Zócalo to explain where hedge funds fit into the financial world and whether they require more or less control, we asked columnist Matt Miller, former chief economist of the International Monetary Fund Simon Johnson, Boston College’s Juliet Schor, and UCLA’s Lee Ohanian to weigh in on what financial reform remains to be accomplished. You don’t read books about reducing deficits on your honeymoon unless you’re a serious fiscal conservative. Trust me, I know. But for the economy’s sake, I’m putting my budget hawkishness on the back burner. Until jobs rebound, we’re all deficit addicts. The surest way to boost jobs – whether you ask an economist, a businessman, or politicians on either side of the aisle – is to cut the payroll tax, thereby reducing the cost of employment. The tax, paid by employers and employees, has soared from one percent to 15.3 percent. It now makes up a third of federal revenue and brings in nearly as much as individual income taxes. It’s also unfair, asking low-income earners to pay a proportionately higher amount than CEOs. Cutting the payroll tax is a political taboo because it implies cutting or at least fiddling with Social Security. Connecting the two was a brilliant idea in Franklin Roosevelt’s day, but no longer. Unfortunately, as Democrats try to cast Republicans as posing a danger to Social Security, they’re reluctant to touch the program – and thus the payroll tax. The ongoing recession and the boomers’ imminent retirement will force us to figure out the tax equation. Ideally, payroll tax cuts would be part of what I call a “grand tax swap,” in which we cut taxes on payrolls and corporations to boost jobs, raise them on dirty energy and consumption, and combine them, eventually, with a measured approach to reducing the deficit. –Matt Miller is author of The Tyranny of Dead Ideas: Letting Go of the Old Ways of Thinking to Unleash a New Prosperity and the host of public radio’s Left, Right, & Center. The financial reform train has left the station. As Paul Volcker laid out forcefully in a brilliant speech last week, our financial system remains badly broken. The Dodd-Frank Act, while including some sensible consumer protection measures, does essentially nothing to reduce system risk as we move into a new credit cycle. Literally the last chance to avoid another huge financial meltdown is to significantly increase capital in big banks – their buffers against losses. Treasury insists that this is its approach, but the international negotiations (in the Basel III process) will increase required capital to levels below that typically held by U.S. banks over the past two decades. How can this help? The Financial Stability Oversight Council will meet for the first time next week. It should immediately start the process of increasing tier one capital in megabanks – with the ultimate aim of something close to a 20 percent capital-asset ratio. As the Bank for International Settlements has emphasized, if done properly, such action will boost growth – and help sustain job creation. –Simon Johnson is co-author of 13 Bankers: The Wall Street Takeover and the Next Financial Meltdown. The conversation on financial reform has been dominated by questions of systemic risk, too big to fail, consumer rights and protections, confidence, and compensation excess. These are all important. But there’s another set of issues that are even more pressing, and that’s the relation between finance and ecological sustainability. My one reform is full-cost environmental accounting. That means financial institutions would have to make decisions based on a price for carbon that is compatible with keeping global warming to an increase of 1.5 degrees, that the impacts on air and water quality and eco-system services would be a part of what determines where and how money flows. If we did this, we’d be getting a wealth of beneficial innovation in the financial sector: location-efficient mortgages, protection of valuable bio-diverse forest resources, accelerated investment in clean, renewable energy, and an end to destructive extractive practices that are imperiling the livelihoods of people around the globe. –Juliet B. Schor is a professor of sociology at Boston College and author of Plenitude: The New Economics of True Wealth. There are a number of critical components that are missing from the recent financial overhaul bill. Two key omissions are the failure to effectively deal with the problem of “too big to fail” and the other is the failure to reform Fannie Mae and Freddie Mac. Too big to fail means that large, systemically important firms were able to take on considerable risk, and when that risk did not pay off, they received government assistance – and in fact anticipated it. The government can promise not to offer bailouts until the cows come home, but big firms know these promises aren’t credible. As long as the government thinks a failed firm would harm the underlying economy, it will offer a bailout. The Dodd-Frank Wall Street Reform and Consumer Protection Act seems to have a lot to say about too big to fail, but it doesn’t address the issue in a satisfactory way. Addressing too big to fail means taking the consequences of risk off the backs of taxpayers, and putting them on those who take the risks. The Act does include what’s called an “orderly liquidation” process – the Federal Deposit Insurance Corporation can intervene as they see fit in bankruptcy proceedings between large financial firms and their creditors. But this effectively institutionalizes the ad-hoc bailout process used in 2008. The FDIC’s inability to take over a large institution, as they do with smaller ones, is the heart of the problem. The Act explicitly provides for bailouts for firms that are “participants in any program or facility with broad-based eligibility” that the Fed has established for emergency purposes, and permits the Fed and Treasury exclusivity on the process for emergency lending. This is intended to prevent the Fed from indisciminately bailing out the creditors of an individual institution, as it did with AIG. But in order to eliminate what appears to be favoritism, this language seems to institutionalize the possibility of bailouts for many firms. Unfortunately, these aspects of Dodd-Frank undo much of the other features of the bill that aim to avoid bailouts and to keep institutions from becoming too big to fail. The Act also fails to reform Fannie and Freddie, the government sponsored enterprises that indirectly subsidized poor lending practices. Effective financial reform means getting incentives right, and that is impossible in the absence of dealing with the operations of Fannie and Freddie. –Lee E. Ohanian is a professor of economics at UCLA. *Photo of Matt Miller by Aaron Salcido. Photos courtesy Juliet Schor and Lee Ohanian. 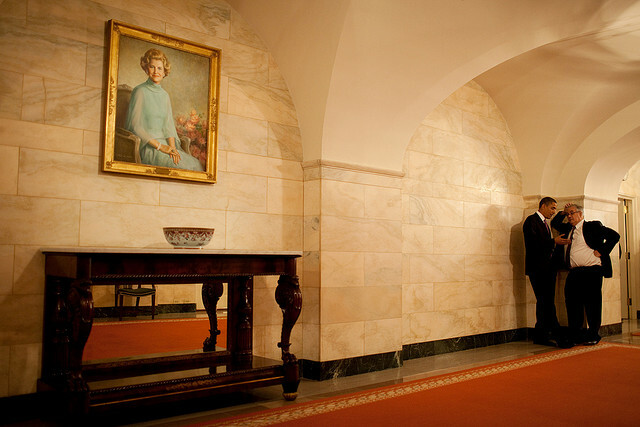 Photo of Barack Obama and Rep. Barney Frank courtesy The White House.